About Redline Technical Group, Inc.
Jimmi' Jammer.com is the home page for Redline Technical Group, Inc. of Chandler, Arizona. Redline Technical Group, Inc. was founded in 1996 as a product development and engineering services company. Services included Computer Aided Design and Engineering, product design consultation, manufacturing engineering and support, and documentation support services. Our first several years were devoted to the electronics industry. In 1998, our company truck was burglarized. The thieves used a screwdriver to pry into the doors to get to the lock rods to unlock the doors. A local Chevy dealer showed us how it was done, and we decided to address this problem. Although we had helped several other companies design and manufacture new products, the Jimmi' Jammer® was the first product which we developed and marketed as our own product. 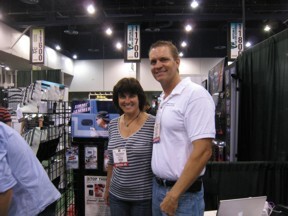 Photo taken at SEMA show in Las Vegas, 2009.
for sharing his booth with us! The Jimmi' Jammer was developed first for 1988-98 GM trucks and SUVs. As we generated exposure in magazines such as Truckin', Todays SUV, Sport Truck, Mini Truckin', Automotive Tradesman, The Body Shop Connection, and other trade journals, we learned that other vehicles were also being entered in this way. A US Patent was granted in June 2000 and we were off! We have since added several new Jimmi' Jammer models to our line, and continue to develop more as we grow. Use the links to the left to check out all of our different products.